The platypus is widely recognised as a uniquely Australian animal. By comparison, relatively few people know that the Australian water-rat (Hydromys chrysogaster) is a genuine native that was part of our environment long before the arrival of its rodent pest cousins - the black rat and brown rat. The water-rat (also known as rakali) possesses a thick coat of soft fur, splendid whiskers, blunt muzzle, partly webbed hind feet and a fat, furry tail, all helping to create a resemblance to a miniature otter. Geoff Williams from the Australian Platypus Conservancy will outline the biology and key conservation requirements of these two fascinating aquatic mammals at Workspace2580, 56 Clinton Street Goulburn, on 1st May at 6pm. He’ll also provide tips on how to go about spotting them in the wild and explain how the community can become involved in an innovative new citizen science program – the Australian Platypus Monitoring Network – to keep track of platypus in local waterways. 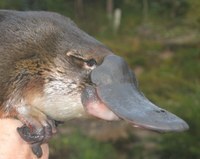 Spokesperson for LachLandcare Inc, Mary Bonet noted that the conservation status of the platypus has now been recognised as ‘Near Threatened’ by IUCN (the International Union for the Conservation of Nature) refecting the fact that there are worrying signs of decline in some parts of its range. Over the past decade APC research has demonstrated that standardised visual monitoring can very effectively track how local platypus populations vary through time. The basic idea is simple: trained volunteers visit fixed monitoring sites at frequent intervals to record the number of platypus observed during a 5-10 minute scan. Crucially, they keep track of both when animals are seen and when they are not. This allows the frequency of sightings – the average number of animals seen per site-visit – to be calculated as an index of platypus activity. The Australian Platypus Monitoring Network website and app facilitates volunteer involvement and training, and allows immediate uploading of sightings records in the field. Participants are also able to obtain personalised feedback about their own monitoring results. Those who cannot monitor on a regular basis can still make a valuable contribution by reporting ‘one-off’ sightings of platypus via the Conservancy website (www.platypus.asn.au). Likewise, reports of sightings of the Australian water-rat/rakali also help improve understanding of this little-studied species. Geoff Williams has been studying platypus since 1994 when he helped found the Australian Platypus Conservancy, an organisation dedicated to researching the conservation needs of the platypus and rakali. Prior to his work with the APC, Geoff was Director of Healesville Sanctuary for five years and, before moving to Victoria, was Assistant Director of Sydney's Taronga Zoo from 1985 to 1988. Geoff has presented numerous public talks at venues throughout Australia, including the National Museum in Canberra and the Melbourne Museum (on behalf of Australian Geographic).